April 24: Guillotine (1792 model, left). 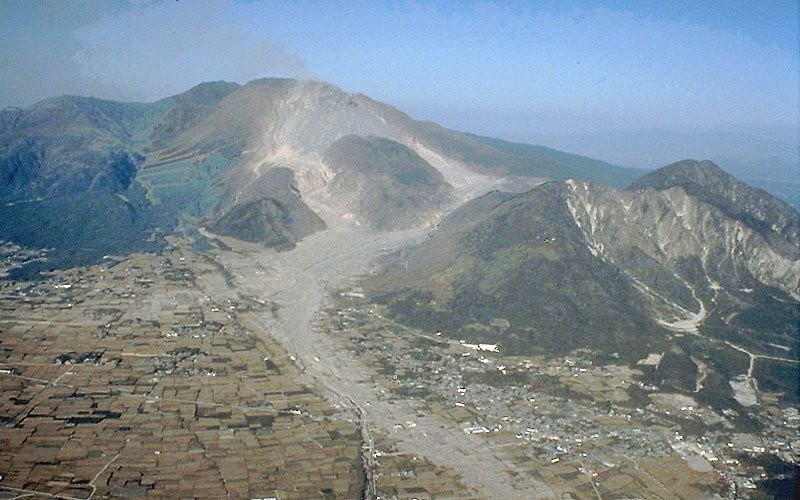 May 21: Mount Unzen (Japan) erupts. January 9 - Treaty of Jassy ends Russian war with Ottoman Empire over Crimea. March 16 - King Gustav III of Sweden shot in the back by Jacob Johan Anckarström at a midnight masquerade at the Royal Opera in Stockholm; he lives until March 29, to be succeeded by Gustav IV Adolf. March 20 - A new capital of North Carolina and county seat of the newly formed Wake County is established after North Carolina State Senator and surveyor William Christmas submits his design for the city. A few months later the capital is officially named Raleigh in honor of Sir Walter Raleigh. April - France goes to war against Austria and Prussia. April 20 - France declares war against the Austria. April 21 - Tiradentes, prime figure in the Inconfidência Mineira plot, is executed in Rio de Janeiro, Brazil. April 24 - First experimental use of the guillotine in France. "La Marseillaise", the French national anthem, composed by Claude Joseph Rouget de Lisle. May 11 - Captain Robert Gray becomes the first white man to enter the Columbia River. May 21 - Old lava dome collapses in Kyūshū, Japan when Mount Unzen volcano erupts: resulting avalanche and tsunami kills about 14,300 people. June 1 - Kentucky is admitted as the 15th U.S. state and as one of its first orders of business ratifies all twelve articles of the Bill of Rights, including one that is technically still pending for consideration. June 4 - Captain George Vancouver claims Puget Sound for Great Britain. August 10 - French Revolution: Storming of the Tuileries Palace - Louis XVI of France is arrested and taken into custody. September 2 - During what became known as the September Massacres of the French Revolution, rampaging mobs slaughtered three Roman Catholic Church bishops and more than two hundred priests. September 11 - Six men steal some of the former French Crown jewels from a warehouse where the revolutionary government used to store them. September 20 - Battle of Valmy - French revolutionary army defeats Prussians under Duke of Brunswick after 7-hour artillery duel. September 21 - French convention abolishes the monarchy and establishes the First Republic. September 22 - Beginning of the Era of the historical French Republican Calendar. October 12 - First celebration of Columbus Day in the USA held in New York; 300 years after. October 13 - Foundation of Washington. The cornerstone of the United States Executive Mansion, known as the White House since 1818, is laid. October 29 - Mount Hood (Oregon) is named after the British naval officer Samuel Hood by Lt. William E. Broughton, who spotted the mountain near the mouth of the Willamette River. December 3 - George Washington is re-elected President of the United States. December 26 - Trial of Louis XVI of France begins. Baptist Missionary Society is founded in Kettering, England. Dominique-Jean Larrey, chief surgeon of the Grand Armee of France, created the first ambulance wagons specifically designed as ambulances. Francis II, last emperor, takes office. Russia invades Poland: War in defence of the constitution. Franz Xaver, an astronomer, publishes "The Tables of the Sun", an essential early work for navigation. George Anschutz constructs first blast furnace in Pittsburgh. Shiloh Meeting House, predecessor of Shiloh United Methodist Church in Lynchburg, Virginia is founded. 103 people were married in 1792. There were 0 military battles in 1792. This page uses content from the English language Wikipedia. The original content was at 1792. The list of authors can be seen in the page history. As with this Familypedia wiki, the content of Wikipedia is available under the Creative Commons License.